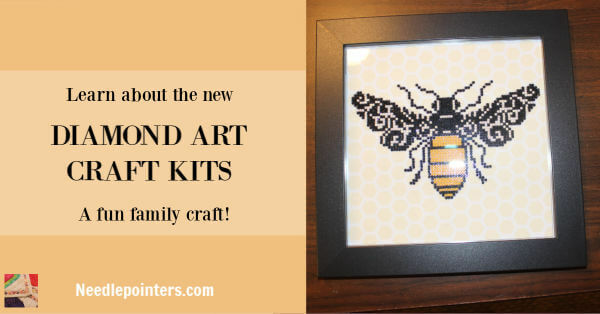 We are excited to bring you this new craft kit, Diamond Art! 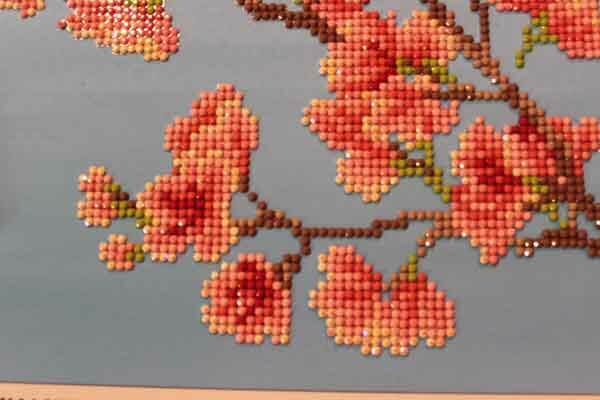 This is a kit similar to paint by number except you are painting with little colored diamond gems. This could be a great family night project. Each member of the family can work on a separate section of the canvas. 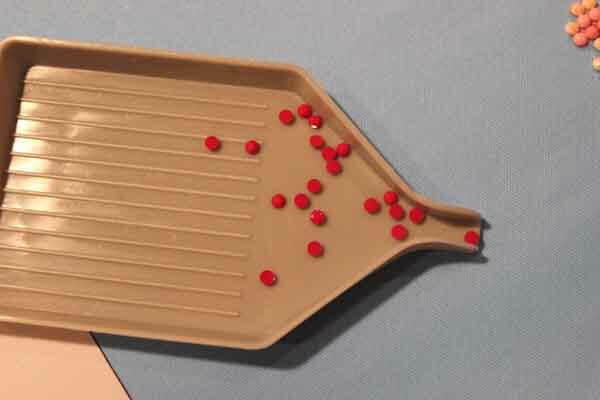 You may need to purchase extra trays and applicators since each kit comes with one set. We were not sponsored in any way to do this article. We found this new product, tried it out and decided we should share it with you. We do have links at the end of this article for purchasing the kits and if you make a purchase, we receive a small commission. The kit does not cost any extra to purchase through our links. We appreciate your support by purchasing through our links. Thanks in advance for your purchase! Watch the video below to learn more about these kits and some great tips on using these kits. Click to watch the Diamond Art Kit Tips and Review video in Youtube. 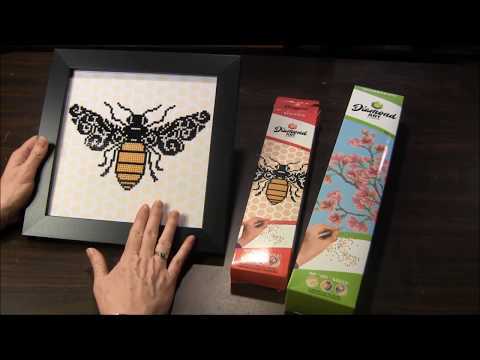 The first kit we tried was this bee kit. It's a beginner kit and is a great kit to start with. I started applying the gems on this kit and my 12 yr old daughter saw it and said "let me try". She proceeded to do the whole entire thing! She loved it so much we purchased two other kits for her. 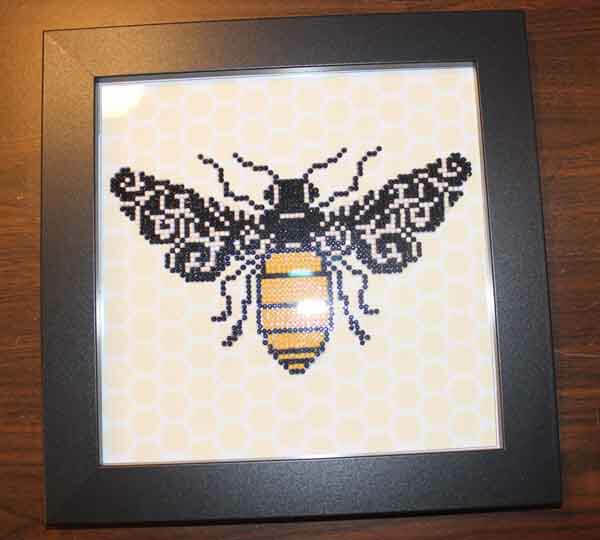 The bee was framed with a frame I found on Amazon.com. Look below for a link. This was an easy way to display this artwork. 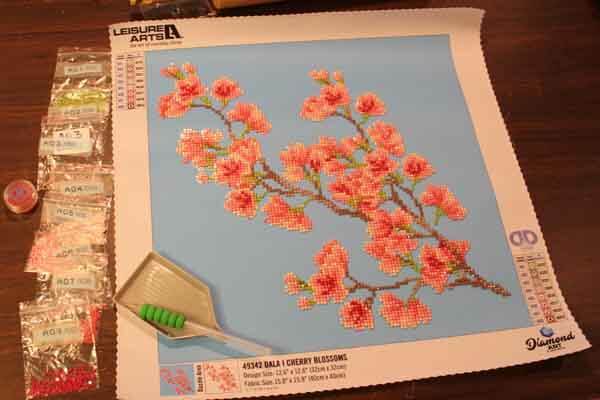 The second kit we purchased is this Cherry Blossom kit. This is an intermediate kit. 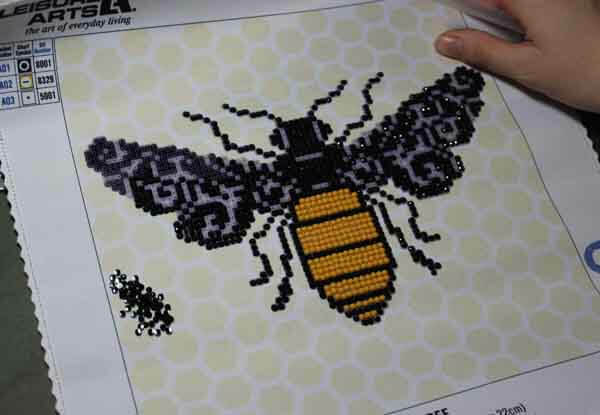 It's not much harder than the bee kit except that it's larger and has more gems to place. 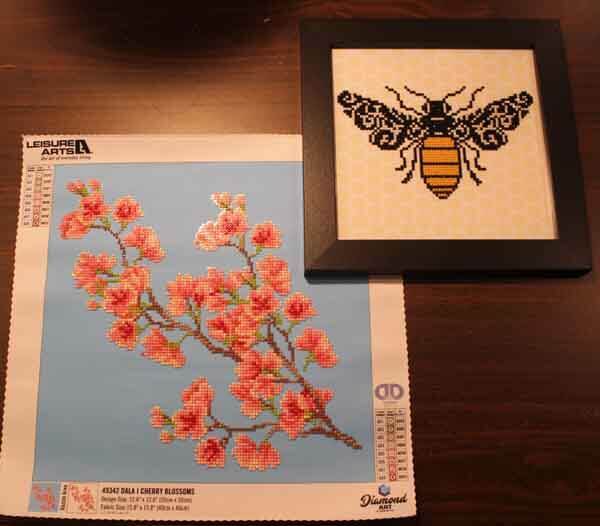 The kits come with everything you need to complete the project (except a frame). 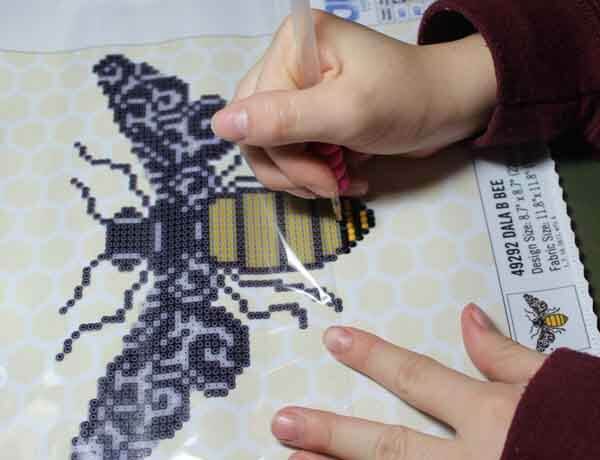 Included in the kits are: Pre-printed canvas with the pattern and gem decode list, stylus, comfort grip, tray, gems and wax. 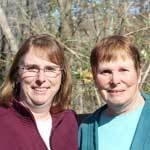 * To do the project as a family, purchase additional trays/applicators. * Roll the canvas in the opposite direction of the curl to get it to flatten out. * Prime the applicator by pushing it into the wax 5 - 6 times. Apply more wax if you have problems picking up the gems. * Pick up the gems from the rounded/cut tops. Pick up ones that are facing up from your tray. Tap the tray gently to get them to flip over. * Only pull back the plastic on the section of the project you are working on. Do not pull the plastic off the entire project. Keep the project covered with the plastic when you are not working on it. * Work filling in rows/columns of the specific color. * Change colors to continue to fill in a section or keep filling in the same color all over the project. * Store leftover gems in separate baggies for each color. Tape the color number to the front of the baggy so you know the color number for each set of gems. * Always recover the plastic over the project when not working on it. The canvas will likely be curled when you first open it. Get it to lay flat by rolling it the opposite direction. Do not remove the plastic covering the pattern. If it still does not lay flat, lift sections of the plastic and replace them. Sometimes this helps to get the canvas to lay flat. You can also place something heavy onto the corners or over the canvas to help it flatten out. To start the project, place the comfort grip onto the stylus so it's easier to hold. Look on the pre-printed canvas and pick a color to start with. 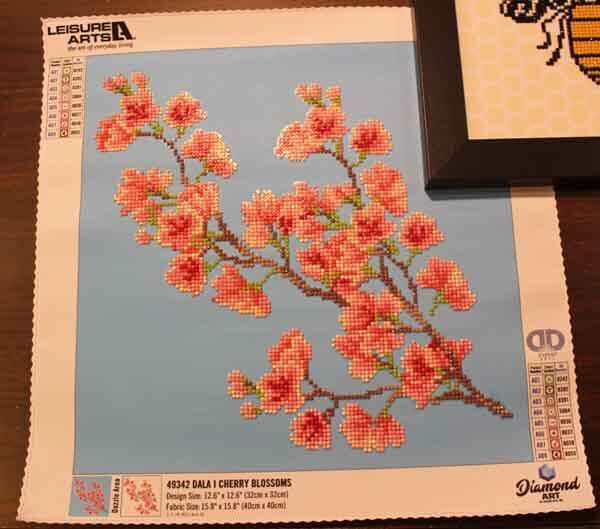 Use the pattern legend printed on the side of the canvas to identify the gem color code which goes with the symbol. Open that bag of gems and place some in the tray. Prime the stylus by pushing it into the wax a few times. Use the stylus to pick the gems up by the cut (non-flat side). Lift up the plastic covering the canvas in the section you will be working. Carefully place the gem directly over the corresponding spot on the canvas. Work filling in one color at a time. Fill in rows or columns across placing each one side by side for the same color. Don't skip all around since it will be harder to fill in later. Gems can be moved by picking them off the canvas with your fingernail. If they need to be moved only slightly, they can be pushed into place. Try not to make a mistake in the same place too much as it will wear off the stickiness on the canvas. 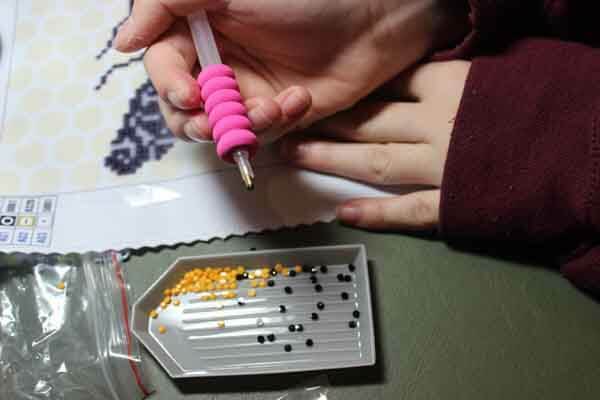 Once you finish working with a color or want to switch to another color, store the remaining gems in the provided small baggies (these are provided with the Leisure Arts kits and may not be provided with other kits). If you did not get small baggies, you can use small snack sized zipper bags to store your gems. Store each color in a separate bag. Cut the color number off of the original bag and tape it to the front of the storage baggie. It's important to keep track of the gem color numbers so you know the correct color number. Some gems are very close in color and are hard to tell apart. Always keep the canvas covered by the plastic over the sections you are not currently working. Also keep it covered when not working on the project. If left uncovered, dust or other stuff could get onto the glue on the canvas and the gems would not stick properly. This is a close up of the tray with the gems in it. A close up photo of the project. It shows how the diamond gems sparkle in the light. This also shows how the gems line up in lines when you are finished. Be sure to place the gems directly over each spot indicated on the canvas so they line up properly. Once you have your project completed, you can frame it in a pretty frame and display it on your wall. We hope you enjoyed seeing this new craft and consider making one yourself.